Well it’s Week 5 and I am moving from ‘thinking’ into ‘doing’. I have built my list of initial podcast guests, and have just about collected their contact details from varied sources depending upon how I know them! I was going to start using an automated scheduling tool but there is such a choice that rather than get bogged down in the minutae of scheduling tools I will just get on and get my first interviews organised. Action is better than perfection to keep us moving forward. Building my potential guest list will become an ongoing feature of my week, since I am hosting a guest based interview show. As a former mainframe programmer I have to admit to looking forward to building my podcast website. I love tinkering with things to make them work – the fascination never ends! 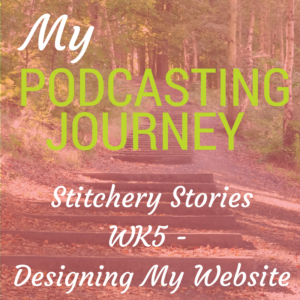 More on WHY you would want a website for your podcast in a future blog post, because this post is about what I have chosen to do, to give you some ideas too. Whilst it is fantastic that our podcast can be distributed to the world via places such as iTunes, Stitcher, and many other ‘podcatchers’, having a ‘hub’ for your podcast helps your listeners access more information if they want to, to access the ‘show notes’, to click on links and sign up to any offers / email lists that you may have that are attractive to them. Of course, you might choose to add your podcast to your existing website, but I have chosen to set up a new domain name and have a new website since my audience for my podcast is VERY different to the audience for my podcasting services. Bit of a Nerd Alert coming up! I use self-hosted WordPress sites for my websites – from WordPress.org, not to be confused with the ‘light’ version DIY website builder provided by WordPress.com – and have used OptimizePress to build them. However, the features within OptimizePress didn’t seem to immediately ‘lend themselves’ to showcasing a podcast, not without quite a lot of fiddling about and tweaking anyway, which didn’t seem the best use of my time. I know from experience that customisation of the Blog functionality is not great, and since basically each new podcast episode is posted as a blog post, it was a major stumbling block. So even though I have a ‘spare’ paid-for-licence, I decided against using OptimizePress for this project. I did quite a lot of research into what others are using, features I liked, features I didn’t, and really liked the WordPress Themes created by Appendipity. They specialise in themes for podcasters, and a key feature is a prominent player for your latest episode. Perfect! Other things I liked were collapsible show notes, playlists, a featured guests section, social sharing functionality and lots of customisation. It runs on the Genesis Framework, so that has to be bought as a one off, ($59.95) and I chose the Maron Pro theme which is also a one off lifetime purchase ($59.95). Advantage is that it gets me a lovely showcase podcast site without too much faffing about. I LOVE that idea. If you have a WordPress theme that you already like, or a website that you are going to add your podcast to, then you might just want to take a look at some nice podcast players to put onto your site. If you are hosting your podcast files on Libsyn then they have a nice player which can also show a playlist. There are quite a few other podcast players which are either free or paid. I liked SimplePodcastPress but since I am going with the Maron Pro theme I don’t need to look at separate players. So that’s the highlight of this week’s effort towards getting Stitchery Stories off the ground. Want A Podcast But Don’t Know Where To Start?